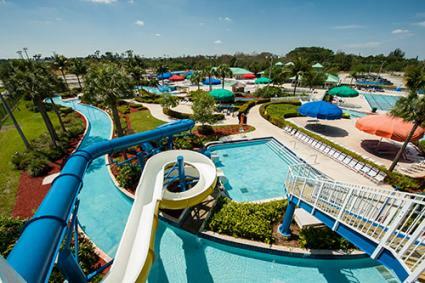 Although guests of all ages will enjoy Calypso Bay Water Park in West Palm Beach, Florida, the general consensus is that it is a fantastic place to bring kids. Reviewers on Google Plus left comments like, "My kids love this place!" and "My son is now big enough to ride on the slides, and he loves them." With a range of attractions and an affordable admission price, it's not difficult to see why this is one of the best places in West Palm Beach to cool off from the hot summer sun. Calypso Bay is part of the Palm Beach County Parks and Recreation Department. 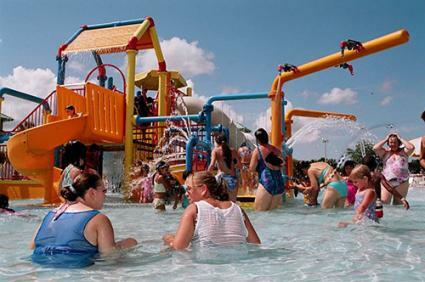 As a municipal park, the water park is part of Seminole Palms Park. It doesn't have the massive attractions of more spectacular water parks, but its convenient location, affordable price, and pleasantly surprising range of amenities makes it a perfect place to spend a refreshing summer afternoon of family fun. Calypso Bay Water Park is home to two four-storey water slides with bold curves and sharp dips. The lily pad walk is just as challenging for teens as it is for children, and guests of all ages can enjoy unlimited floating in the park's 900-foot lazy river. A lap pool and diving boards are available for serious swimmers. As for the children's water playground, one reviewer states, "The kids love it! It shoots water, sprinkles like a shower, has tubes to crawl through and slides to go down. If your kid is not into that, you can sit down and let him just hang around splashing in the water." The five-acre water park is also equipped with locker rooms and showers. A moderate concession stand offers drinks, burgers, hot dogs, pizza, and ice cream. After these delicious treats, the lounge chairs with oversized umbrellas quickly become popular lounging spots. The park will not allow you to bring in your own food, but you can still still enjoy a picnic outside the premises in Seminole Palms Park. The park has a children's playground, as well as baseball and softball fields to enjoy. There is limited space available, and the park states on their website that the picnic tables are available on a first come, first served basis. As another reviewer states, "The cost of Calypso Bay Water Park is less than half of what it costs to get into Rapids Water Park, and it's just as fun"
All day admission for adults is just over $10. Children between ages 3 and 11 get in for under $9. Children 1 to 2 years old are admitted for just over $5. Children less than one year old are admitted free. An adult and child combination season ticket is available for $160, but you can also purchase season tickets individually if you prefer. Group tickets are also available. Parking is free, and guests who leave the park can have their hands stamped for free readmission on the same day. Further discounts are available after 3 p.m. and on Family Fun Fridays. To make the most of your visit to Calypso Bay get there as soon as the park opens. If your child can't swim, ask for one of the park's complementary, coast guard-approved life vests, and head for the children's playground. After a morning of fun, you should plan to arrive slightly early at the Seminole Palms Park to claim a picnic table. Larger groups can enjoy a baseball game or play soccer, touch football, Frisbee, or other games on the multipurpose fields. As the day heats up, it's time to head to the water park for a refreshing dip in the lazy river, followed by thrilling rides down the water slides and some splashing fun at the lily pad walk. Pick up an afternoon snack at the concession stand and enjoy catching some rays on one of the park's sunny lounge chairs, which are available on a first come, first served basis. If you live nearby, you may want to take advantage of the park's swimming lessons, which are available in June. Organized by the American Red Cross, classes are available for swimmers of all ages and skill levels, from level one Introduction to Water Skill up to level four Stroke Improvement. The cost runs about $55 for a 30 minute session. For more information about Calypso Bay, visit the official website, or call (561) 790-6160. Since Calypso Bay is not well known, it's easy to enjoy all the park's attractions quickly since the crowds are usually small. 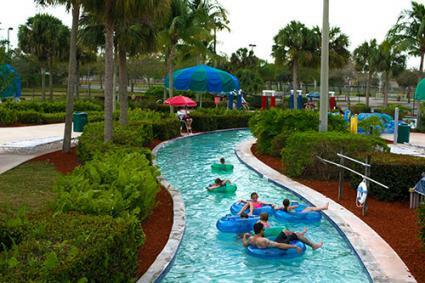 The fun, laid back atmosphere makes this water park the perfect place for West Palm Beach residents to relax on a sunny day. It's also a wonderful summer getaway destination for Florida visitors.